The Hero Round Table is a worldwide event series that inspires and instructs people to do extraordinary things. Our Ambassador of HOPE, Suzanne Bernier is a speaker at the conference. For the past 2 years The Hero Round Table have created Stars of HOPE with the group. The First year the stars were brought from the Amsterdam conference to Brussels. They were delivered to the Place de la Bourse, the site of the memorial at the foot of the stairs of the Brussels Stock Exchange. 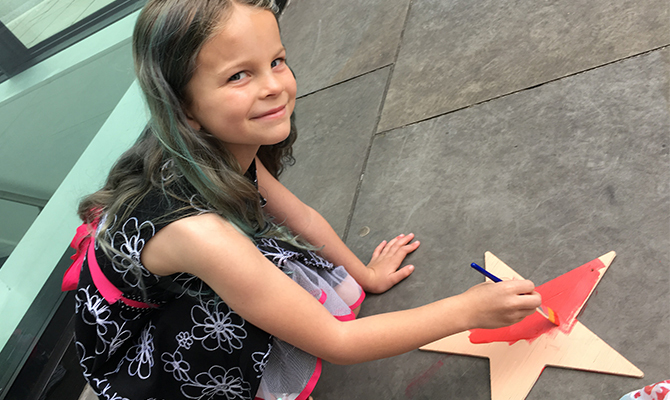 The second year Stars of HOPE were brought to London and a very special star was created by Vienna, the young daughter of the founder of The Hero Round Table, she expressed interest in her star going to Ile-Bizard in Quebec. It was delivered by a Montreal firefighter and is now hanging on the bridge where the worst flooding occurred. HOPE goes where it is most needed.